President Trump delivered a rousing speech to his supporters in Pensacola, Florida on Friday night in an effort to animate Americans to continue pressing for change in Washington, D.C. He arrived to throngs of supporters waiting for him outside of the venue. And then once inside, the stadium was packed with pro-Trump voices. 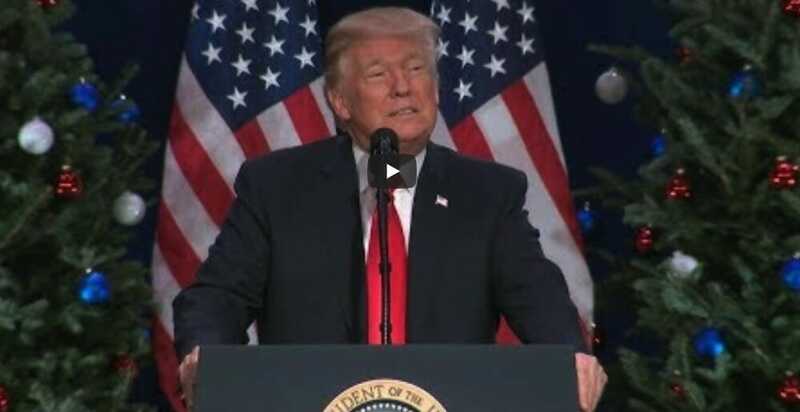 The President then launched into a 75-minute speech where he called on all Americans to continue the struggle to return our nation to greatness. The Democrats in Washington want to grow our welfare rolls that you’re going to pay for. They want to grow all sorts of things that you don’t want to even think about. I want to grow our employment rolls with great jobs, well-paying jobs, jobs of dignity, jobs where people love waking up in the morning and going to work. And that’s happening. So we’re going to lift our people from welfare to work, from dependence to independence, and from poverty to prosperity. We will restore hope to our struggling rural communities and to our inner cities where we are making progress. We are making progress. We will build new roads and bridges and tunnels and highways all throughout our land. Factories will come roaring back to life. New works of iron and steel will be forged from fire and from spark and from our country. And they will be made with American muscle, American hands, and most importantly, American heart. TRUMP: And these creations will be branded with a very simple but very beautiful phrase, made in the USA. TRUMP: We have it in our power to build this future together, a future of patriotism, prosperity and pride. We all share one home and one glorious destiny. And whether we are young or old — I feel very young, do you feel young? TRUMP: We all salute the same great American flag. TRUMP: And we are all made by the same almighty God. TRUMP: We are the nation that dug out the Panama Canal, won two world wars, put a man on the moon, and brought communism to its knees. TRUMP: As long as we have the courage of our convictions, and the strength to see them through, then there is no goal beyond our reach. As long as we are true to our values, loyal to our citizens, and faithful to our God, then we will not fail. TRUMP: This is your land. This is your home. And it’s your voice that matters the most. So speak up, be heard, and fight, fight, fight for the change you have been waiting for your entire life, for the change that you already see happening. Our revolution didn’t end on November 8th. That was just the beginning. TRUMP: The greatest adventure still lies ahead. Never give in, never give up, never back down, and never ever stop dreaming. TRUMP: Because we are Americans and the future belongs to us. The future belongs to all of you. So with American pride swelling in our hearts and American courage stirring in our souls, I say these words tonight, together we will, indeed, make America strong again. TRUMP: We will make America proud again. TRUMP: We will make America wealthy again. TRUMP: We will make America safe again. TRUMP: And put it all together and what do we have? We will make America great again. On Saturday the President will be in Mississippi for the opening of an important Civil Rights museum, and then in the evening he’ll hold another rally for his base in the Magnolia State.